Suffering. It seems like this is something we can’t escape today. No matter where you look, there is suffering of all kinds and in every walk of life. What is suffering? It is defined as the state of undergoing pain, distress, or hardship. It is to experience, be affected by or be subjected to something bad or unpleasant. This word originates from the latin word “sufferre,” which, when broken down means sub (from below) and ferre (to bear). When thinking about this, the very word seems like something tragic and troublesome. Still, sometimes there is joy even in the darkest times of our life and in such terrible periods of suffering. One of my favourite passages of scripture is found in James 1:2-4. “Dear brothers and sisters, when trouble comes your way consider it an opportunity for great joy. For you know that when your faith is tested, your endurance has a chance to grow. So let it grow, for when your endurance is fully developed, you will be perfect and complete, needing nothing.” Just sit back for a moment and really think about that verse. This concept of having joy through suffering really appeals to me. 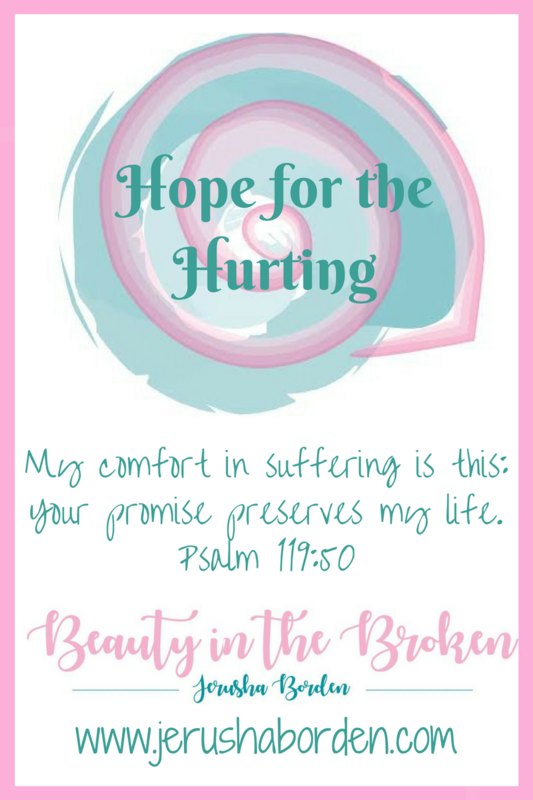 In fact, I would love to unpack this based on Scripture but there is so much goodness and evidence of joy in suffering in God’s word, it is far too much for just one blog post. So today, let’s just take a look at Naomi in the book of Ruth. Ruth is a wonderful story. Ironically enough, it is wedged in between Judges and 1 Samuel in the Bible. In these other books of the Bible, you read about the Isrealites who have settled in to the promised land. Their two faithful leaders Moses and Joshua have died, and so the Isrealites have really lost their way. They are messing up and making mistakes all over the place. As it says in Judges 21:25, “in those days, Isreal had no king and the people did whatever seemed right in their own eyes.” Then in 1 Samuel, they get their king but it doesn’t completely turn out as they expect and there is a lot of death and bloodshed. What a mess! Then, like a rose between two thorns, we find this book of Ruth. Ruth is a beautiful story of loyalty, love and redemption. It is also one of the shortest books of the Bible that you can read in one sitting (and I encourage you to do so, if you have not already). In a nutshell, hard times fall on Ruth and her mother in law Naomi, and they have to figure out a way to survive and thrive – as soon as they can. Let’s take a deeper look. The book of Ruth opens with a nightmare. In fact, it is one of my biggest fears. It sets the scene that things are not going well for Isreal, and there is famine and suffering in the land. Some people have to leave their homes and move elsewhere to look for food and nourishment due to a famine. Such is the case for Naomi and Ruth, who is married to one of Naomi’s sons. Then, the unspeakable happens. Naomi’s husband dies. Oh, so broken is the heart of a woman whose love is lost. If I close my eyes and truly think of it, my heart breaks for Naomi here – because to lose my husband is my biggest fear. I don’t know what Naomi’s marriage was like, but mine is so blessed. I am married to a wonderful man of God who loves and cares for me so deeply. Someone who God has graciously placed in my life. I can only imagine the heartache that Elimilech’s death must have caused. Still, women take comfort in those they love, and Naomi had her two sons Mahlon and Kilion. Let’s pause here for a moment and take a look at these names. Names are all over the Bible and they all hold special significance and meaning. In thinking about suffering, it is important to consider the implication these names provide. Looking at all those names, what stands out the most? The names of Naomi’s two sons. Yikes! Why would you name your children that? But it is interesting to see that these two names of the sons really translate into suffering. Which is interesting, because Scripture tells us that only ten years after Elimilech died, her two sons died as well. Oh, Naomi! Here she has no husband. Her two younger sons were gone, and neither one of them had had any children. Naomi was heartbroken and feeling so alone. It is interesting to see what happens here, after she is left without her husband and sons. She turns to her two daughter in laws and offers them the opportunity of escape. You see, back then women could not just run out and get a job that would allow them to live as they had been living. The death of your husband would leave you dirt poor with little hope. So Naomi encourages these two women to go back home to their parents to be looked after. Orpah decides to leave, but Naomi out of love for her mother law decides to stay. She pledges her love and allegiance to her mother n law, even though the future is very uncertain. The story continues with the two women travelling back to Naomi’s home land. Without her husband and sons, she is feeling broken and wants to change her name to Mara (which means bitter), “for the Almighty has made life very bitter for me. I went away full, but the Lord has brought me home empty. Why call me Naomi when the Lord has caused me to suffer and the Almighty has sent such tragedy upon me?” Uh oh. Do you see what Naomi is doing here? Not only is she playing the blame game, she outright says that God is purposefully trying to cause her harm. Does that sound like something a loving God would do? Let’s take a step back and think about how much like Naomi we can be. When we face tragedy of any kind, we struggle to understand why God has allowed something so terrible to happen. Deep tragedies like the loss of a spouse, a still born baby, or news of a devastating illness can cause us to temporarily forget that overall God is GOOD. We forget that He loves us. We forget that He orchestrates everything in and around us for our good. Do we need a reminder? Psalm 119:68 says, “You are good and do only good; teach me your decrees.” Not enough? Psalm 145:9 – “The Lord is good to everyone. He showers compassion on all His creation.” Yes, even in suffering, God is so good. It is difficult to look at a tragic situation filled with such suffering and see the good in it. It is even more difficult to see the God in it. Sometimes, we will never know the reason why we have had to go through the dark and troubling times in our lifetime. But when we look at Biblical examples like this, it can give us hope and it can give us JOY. Okay, so Naomi is angry at God. But that is not the end of her story. She and Ruth continue on with their story. In order to survive, Ruth has to go out into a farmer’s field and scavenge to see what she can find in hopes to be able to collect enough grains to make some bread. It was not coincidence that she wound up working in a field belonging to Boaz. That was all part of God’s plan for Ruth and Naomi. You see, back in the day there was something called a “kinsman redeemer.” This was basically a man who was in some way related to the family member who had died. It was their responsibility to marry and protect the widow who was left behind, and hopefully to provide an heir to carry on the family name. Do you see the hope here? Naomi, who was facing down a life of loneliness and defeat was given a second chance at a family. Ruth could have taken Naomi’s advice and run off to her parents like Orpah did. Instead, she chose to stay with Naomi. That decision to stay opened up the opportunity for a fresh new possibility of a full life. And that is exactly what God gave them. But as only God can, He did something really, really cool here. Let’s take a look. Ruth goes into the fields that Boaz owns and asks for permission to pick up any grain the farmers might drop. Granted permission, she works away all day in the hot blazing sun. I don’t know about you, but that does not sound like a fun time. That sounds like a lot of work for a little result – a loaf of bread to share with her mother in law. But Ruth works and works, and while she works, Boaz notices her. He seeks out information about her, and reaches out to her in kindness, asking his servants to allow her to pick her grain right alongside them instead of her scrounging for leftovers. Then when she asks him why she is being so kind to him (since she is a Moabite, and the Moabites did not always see eye to eye with the people of Judah), he points out that her character has preceeded her. Chapter 2:11-12 say, “I know everything you have done for your mother in law since the death of your husband. I have heard you left your father and mother and your own land to live here among complete strangers. May the Lord, the God of Isreal, under whose wings you have taken refuge, reward you fully for what you have done.” And that is exactly what He does. Naomi suffered a devastating loss. She was angry at God. She might have wondered why He had allowed the death of her sons at such a young age. She might have grieved more because she had no grandchildren. 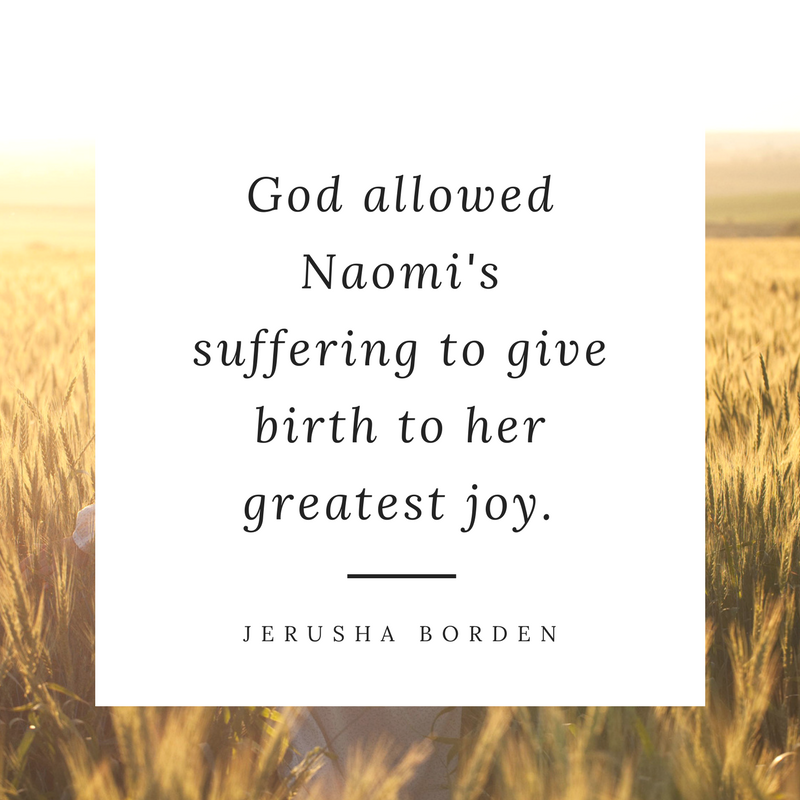 But God allowed for her suffering to be part of her greatest joy. How wonderful that there is beauty in the brokenness and that we have a good God who gives such great gifts to His children.